I returned on Monday (June 8, 2015) from the Brink Conference in Palm Springs, CA, USA. As the name implies, Brink is a collaboration of futurists, not historians; so today I find my mind stretched between the historical focus of HCLE and the possibilities that history implies. Here’s an example. This morning I received an email offering free, lifetime “cloud services” to LO*OP Center, Inc. as a non-profit organization. Sounds wonderful — free, accessible file storage so all HCLE participants can collaborate. But wait. In my dark entrepreneurial past I was involved with an encryption/security company, then a company specializing in data storage and forwarding services and I helped found a company that ran a server farm. I know that “the cloud” is a metaphor, not a reality. I know that there are holes in our data encryption shields. So before signing up for this “cloud” I checked out the company’s web site and even phoned technical support. I wanted to discover “where” my data would be stored and “who” would have access to the physical machines that masquerade as a “cloud”. Pity the poor young, Philippina, technical support operator who answered my call. After consulting her knowledge-base and her supervisor she could tell me that my data would be secure “in the United States”. She could not tell me where in the US the corporate headquarters were located. I didn’t sign up for the service although it is probably just as secure as anything available. I renewed my resolve never to put critical information online but to use “the cloud” for everything I want to share. Those of us who work in a screen-illuminated office or wander around with a connected device in our hand are living what was science fiction just a decade or two ago. At Brink, I listened to over two dozen pitches for cutting edge products and services that are available today to extend our lives, obsolete our mental and physical labor and entertain ourselves during the time we save. It was exciting, inspiring. But only fleetingly did we nod at the 10-ton elephant in the room. What happens to our human sense of meaning and purpose when we no longer need “work” as we now know it? Are we prepared to completely revise the assumptions, values and taboos on which we have built the previous 3,000 years of culture? Are we going to turn our backs to the possibility of everyone surviving without struggle because we can’t figure out how to adapt to it? In that future (which started while you were reading this blog) we need to understand how our metaphors dance with the real — what concepts are just fog created by highly creative and well-paid hype-crafters and what fundamental hypotheses are crumbling under the tread of adorable-looking robots. We are already sitting on the elephant. If we want to participate in deciding where we go together it behoves us to consider where we both came from and where we are willing to go. In this reblog, ed tech writer, Audrey Watters, tells it like it is: Although educational technology is often seen as a liberator by its creators, the actual effect is likely to be constriction of the learner. Read this article through to the end and then consider your own goals for education. This talk was delivered at Davidson College as part of its Annual Teaching Showcase. Ostensibly, it’s an argument for student agency and education technology. (At least, that’s what I was asked to speak about.) 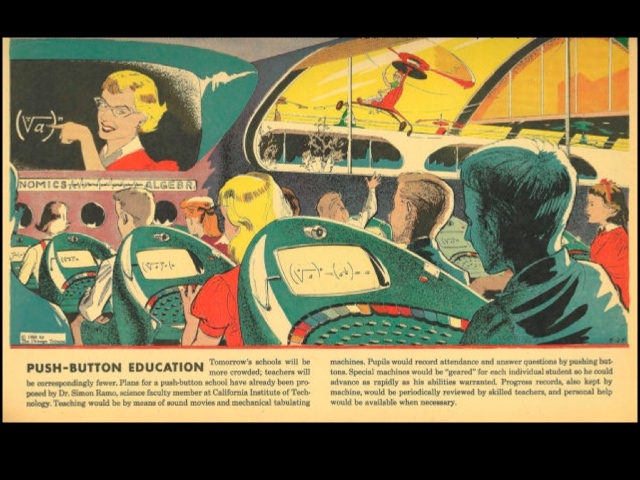 So I traced the history of education psychology and teaching and testing machines – through Wonder Woman….